The Klamath River is the second largest in California with headwaters in Oregon. At one time, it had the 3rd largest Salmon runs on the west coast. Dams, reduced flows, sedimentation from logging, increased temperatures, water diversions, herbicide spraying, farm and ranch runoff, septic and sewer discharges, ocean over-fishing and other factors have reduced the runs substantially. In 2002 these factors culminated in a Salmon Kill -- 70,000+ Salmon died on the banks of the Klamath River. Though the other factors are fairly well known, little is known about the sources of toxic chemicals in the Klamath Watershed, their affect on the Salmon and on the indigenous people who consume them on a regular basis. Toxics in the air also affect the watershed. Habitats are damaged as the ecosystem responds to the toxics. Traditional herbs and foods become toxic to those who gather them for food, medicine and basket weaving. EPA Toxic Release Inventory (TRI) - Toxic chemical releases to the air, land, water, injected underground and transferred offsite. EPA Permit Compliance System (PCS) - Facilities who are permitted by EPA to pollute the waterways. EPA Comprehensive Environmental Response, Compensation and Liability Information System (CERCLIS) - Sites that were on, are on or are proposed to be put on the Superfund National Priority List (NPL). EPA Resource Conservation and Recovery Act Information System (RCRIS) - Hazardous waste transfer, storage and disposal facilities (TSDF), generators and transporters. EPA Risk Management Plans (RMP) - Worst case scenario of possible toxic chemical accidents. These official sources, unfortunately, do not cover all of the toxics. Many more exist that are not at all or are very poorly documented. At one time, many areas of the Klamath Watershed were heavily industrialized. There were many dozens of lumber mills, mining operations, canneries and the like. It is likely that many of these should have become Superfund sites and cleaned up, but there is a documented bias to what gets listed as a superfund site and how much, if at all, is cleaned up. 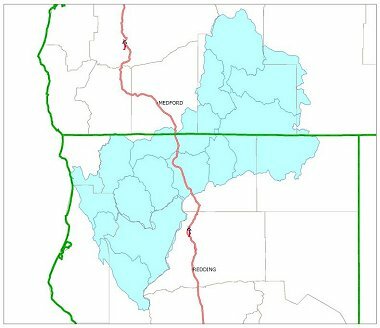 It is likely that this bias has played out in the Klamath Watershed, leaving many yet unknown toxic chemicals in the ground to make their way into the Klamath River and its tributaries. Besides collecting the official data and doing historical research, my hope is that folks like you will tell me what they know about potential toxic sources within the watershed. If you know of any sites or sources that should be investigated or know of someone who does, please fill out the form below as completely as possible. Your privacy is of my utmost importance and I will take all steps to protect it. I will begin by collecting federal data on toxics within the boundaries of the watershed. I will make maps with this data and the data that you provide so that they can be interacted with on the internet, downloaded in Acrobat PDF and ESRI shapefile formats. You may be wondering, who is this guy? I don't blame you - I'd wonder too. Here's a little summary. I've done quite a bit of mapping of toxics. You can see some of these here. Most recently, I've been working with Willard Carlson Jr. doing photography, cartography, videography, presentation and website development for the Blue Creek - Ah Pah Traditional Yurok Village.